Comments: Located at 345 East Main Street, the Colonial House (also known as the Fore House) is possibly the oldest remaining building in Scottsville. The back wing of the house was built ca. 1732, and the front part of the house was built in 1780. In 2010, this house still has its original beaded siding with rose-headed nails. 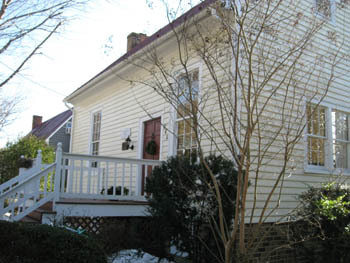 The Colonial House is one of 53 historic buildings in Scottsville's 1976 historic district listing on the National Registry of Historic Places. 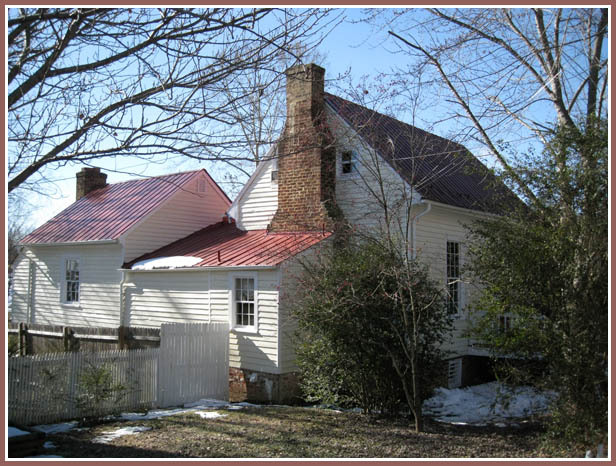 In 1841, the Albemarle County land records indicate that this Scottsville property, lot #21, was owned by Samuel W. Tompkins. At that time, only one lot physically separated this house from the James River. In 2010, the grass-covered levee and the railroad tracks physically separate this house from the river. Originally a hall-and-parlor-style dwelling and linear in plan, the house has a one-story shed-roof addition on the east facade and a one-and-a-half story rear addition to create an L-shaped form. 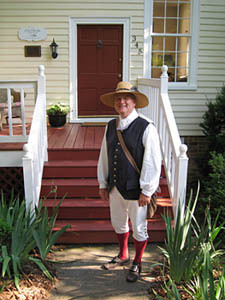 Pictured below is the front of the Colonial House as this June 2009 Batteau Festival participant in colonial attire stopped by for a visit. This reenactor had stopped his batteau for the night down on the nearby James River bank and walked into town, looking for food and drink. This modern day strategy was probably quite similar to the thinking of 18th century batteau men after a long, hot day on the James as observed by early residents of this house. The above photos are from the Connie Geary Collection at Scottsville Museum. Reference: U.S. Department of the Interior, National Register of Historic Places, Scottsville Historic District (Updated Nomination and Boundary Increase 12/3/2003; VDHR File No. 298-0024, Section 7, page 6).